My gaming group has been brainstorming some ideas for Adepticon and we finally settled on an idea! We are totally digging the idea of fallen Grey Knights. The idea being that Chaos wants to mock the ultimate defenders of the human race so they corrupt them, steal their equipment, and even raise them from the dead and have them fight their allies! 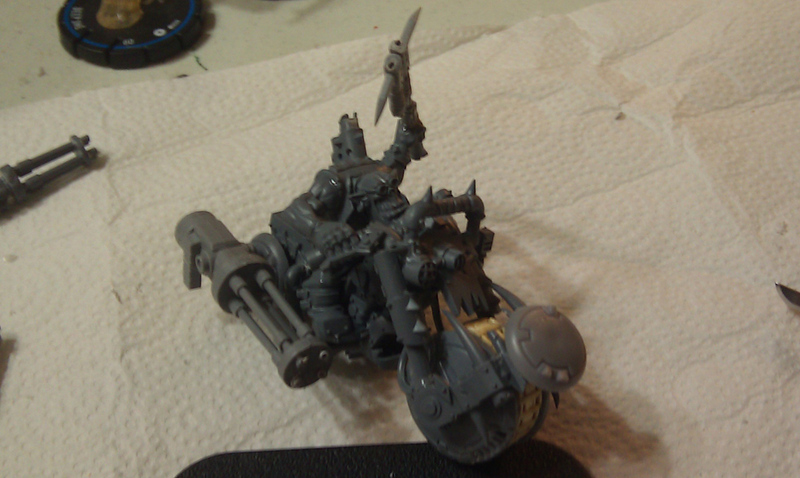 So the floor is pretty open for conversions, crazy paint jobs, and all sorts of other hobbying fun. I know I wanted to make Grey Knights that were risen from the dead as zombies, we will see what other ideas my teammates come up with. My first zombie Grey Knight! 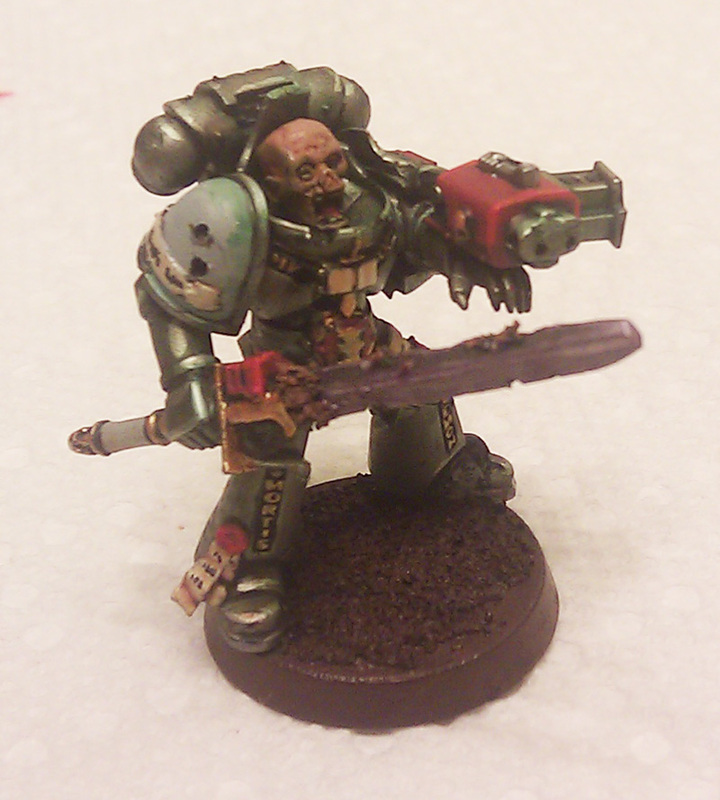 I started painting this guy a while ago but as far as I remember I used Boltgun Metal, Mithril Silver with a heavy green wash followed by a brown wash. The sword was the same metallics with a purple wash. The red was Mechrite Red with a Blood Red highlight, and the rest was details. We are still thinking of an official name for our team but probably something along the lines of mockery or deception. Any thoughts? Now we have to play test a few lists and see what we like. It occurs to me that I completely forgot to include pictures in my last post. I was so excited to post my results that I forgot to add in the in game photos and photos of my team. I have decided to make up for it by posting a whole swathe of pictures in this post. So in the gallery below you will see our finished Adepticon force, some in game shots, some other teams on their display boards, and at the very end you will a gorgeous display board set up like the defense of Terra. I hope you enjoy the eye candy. Well I am after a fun filled weekend at Adepticon. I played in the team tournament Saturday and the Blood bowl tournament on Sunday. I had a lot of fun at both events but I am thinking that next year I need to plan a 1/2 day activity after the team tourney. 14 hours of gaming can really take it out of you. Now that the Blood Bowl league is over I have some time to share all of the work I have been putting in for the Adepticon Team Tournament. If you don’t know what Adepticon is I’ll provide a quick overview. Adepticon is a massive wargames convention. It is known for its 40k team tournament but it has lots of other events for Warhammer 40k, Warhammer Fantasy, Blood Bowl, Warmachine, Flames of War, and other miniature war games. Since I have already spent so much time on my Deathwatch figures over this past year I decided that I could easily make a 1000 point force. I was able to use most of the models I had already assembled but my list requires another ~20 infantry and 3 vehicles. Being distracted by the Blood Bowl league for the last two months leaves me in a little bit of a time crunch so I am hoping to get all of my minis done to a high quality and still have time to create a display board. Greg decided to play with his Vostroyan force and paint it up with an inquisitorial theme. Gerry was hoping for the Grey Knights codex to be released early 2011 but since that fell through he is using his Raven Guard. Craig the 4th and final member of the team is planning on bringing Black Templars. Well I just came back from a fun filled weekend at Gen Con. In addition to playing board games, costume contests, and hobby seminars I was able to pick up a copy of Deathwatch and the GM Essentials both of which are written by Fantasy Flight Games. It is important to know that I am not a big role player and I only play the occasional game. But this book makes me want to become a full time role-player. The book is fantastic. They have a great mechanic for combat and I especially like the way they deal with space marine’s ability to fight off hordes of enemy troopers. The fluff is well written and they do an especially good job giving us the fluff we need to know about the Deathwatch and still leaving some mystery. They write about the chapter, specialties , organs, armor, alliances, battle tactics, etc. The classes, also known as specialties in this game, are pretty standard; if you have played a RPG you will recognize these classes right off the bat. One of the areas that could be fleshed out are the available space marine chapters. Fantasy Flight in their wisdom has already addressed this: the designer of the game mentioned that an expansion is in the works with extra chapters as well as full rules to design your own chapter.